Any way to change the shader type of all materials in a scene? I'm currently working on a prototype for a game and want to change the shader type of all materials in the scene at runtine to test different art style variations. Ofc i could drag and drop each single material and set property at key down or compile an alternative version, but maybe there is a more efficient way that i'm not aware of. Re: Any way to change the shader type of all materials in a scene? you could have two material (x + toon), have the textures in array and then set material and set the texture when needed. Different texture on same material.. 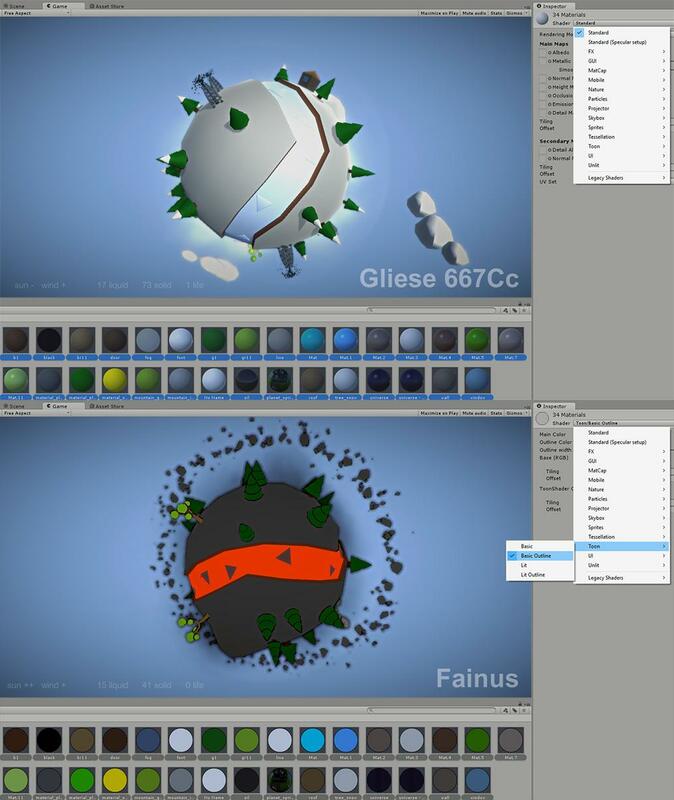 Select all the materials you want to change and multi-edit them in the Inspector to change the shader. You could make a Favorites search for the materials (like the All Materials search) or keep them in one folder for easy selection. I'll simply do it the "set property" way for each single one...just takes a few minutes to set it up so it's no big deal. Was just curious if there is a some way (for upcoming projects with more materials) to do it with one or two actions, like selecting all material in the scene and change shader. Yeah, now that we have array support in 1.8.0 I'm playing around with an idea for Selection Actions. Basically letting you build a search that populates an array, so you can quickly perform actions on that selection. The idea would be to have a modular system for building searches so you could make quite complex selections. Kind of like online SQL query builders, letting you combine SELECT, WHERE, AND, OR etc. User friendly but powerful.